The subject of W. Eugene Smith's celebrated 1948 photo essay "Country Doctor," Dr. Ernest Ceriani, the overworked physician of Kremmling, Co., was the only doctor within a 1,200-square-mile region. 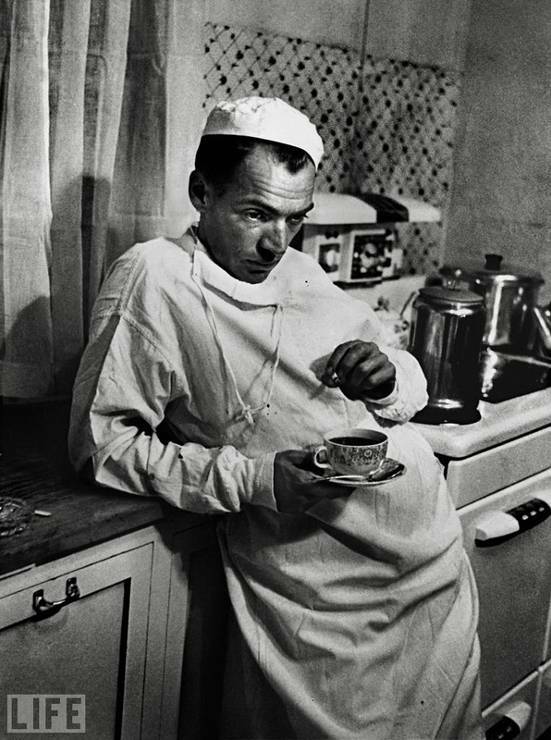 In this image, he is in a dazed state of exhaustion, having a cup of coffee in the hospital kitchen at 2 a.m. after performing a caesarean section where the baby and the mother both died because of complications. The classic photo reveals him as simultaneously heroic and tragic -- and absolutely unforgettable. Dr. Ernest Ceriani a fost subiectul lui W. Eugene Smith in sesiunea fotografica intitulata "Doctorul de tara" din 1948, acesta fiind medicul suprasolicitat de Kremlin si singurul doctor pe o raza de 1.200 de mile. In aceasta imagine el este intr-o stare de epuizare si ameteala, band o cana de cafea in bucataria spitalului la ora 2 dimineata dupa ce realizase o cezariana in care atat copilul cat si mama au murit din cauza complicatiilor. Fotografia clasica il surpinde, in acelasi timp, evidentiind partea eroica cat si tragica - si absolut de neuitat.